We’d love your help. 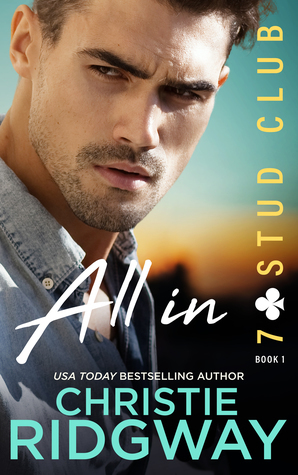 Let us know what’s wrong with this preview of All In by Christie Ridgway. To ask other readers questions about All In, please sign up. John Boone is one hot, sweet, alpha male. He sure made me swoon with his words, his actions, and his declarations. However, he never thought he would ever be with a woman for more than 3 days max, but that all changed when his next door neighbor Gemma weasels her way into his life. Not just his life, but his heart and breaks down all of those walls he has erected. Gemma has learned from her mother's and aunt's combined seven marriages and divorces that love and marriage are not all they are crac John Boone is one hot, sweet, alpha male. He sure made me swoon with his words, his actions, and his declarations. However, he never thought he would ever be with a woman for more than 3 days max, but that all changed when his next door neighbor Gemma weasels her way into his life. Not just his life, but his heart and breaks down all of those walls he has erected. Gemma has learned from her mother's and aunt's combined seven marriages and divorces that love and marriage are not all they are cracked up to be and that eventually everyone leaves. But she wants to make the exception for Boone. She never realized how hard she could fall for someone and how much she likes being needed by him in his time of despair. Gemma and Boone sure are one hot couple! They have instant attraction to each other even though they both try to deny themselves and try the whole friends thing, then friends with benefits, but that doesn't last all too long. It takes some time for the two of them to come to the realization that they are meant to be together as a couple and really give this thing they have a true chance at forever happiness. A new series is always exciting. All In is a great start to this one. We meet 7 guys who have been friends for a long time. They have strong bonds with each other. Boone is the hero in the first in this series. He's always thought he wasn't cut out for a serious relationship with a woman. Then, he meets Gemma and the fun begins! Gemma has her own reasons for not wanting a serious relationship too. But as a lot of things in life, you don't always get what you want. I loved their story as they lea A new series is always exciting. All In is a great start to this one. We meet 7 guys who have been friends for a long time. They have strong bonds with each other. Boone is the hero in the first in this series. He's always thought he wasn't cut out for a serious relationship with a woman. Then, he meets Gemma and the fun begins! Gemma has her own reasons for not wanting a serious relationship too. But as a lot of things in life, you don't always get what you want. I loved their story as they learn what it is they really want and how to get it. The story was emotional and feel good. Many characters were introduced and I look forward to each of their stories. I received an advance copy for an honest review. Boone is a rough and tumble construction supervisor who is pretty satisfied with his life. He has great friends, a Dad he can talk to (somewhat), and a wide variety of women to take to bed. All-in-all, life is pretty good, until he meets his pretty neighbor Gemma . Gemma has that polished look about her. She bakes brownies, soothes wounded hearts and souls, and has a “girly” business downtown, but Gemma breaks through Boone’s tough veneer and becomes indispensable, something Boone absolutely does NOT want.